In 1980, General Computer Corp (GenComp/GCC) was making mod kits for games, including one for Missile Command, and one for Pac-Man. Their Pac-Man add-on was quite innovative. 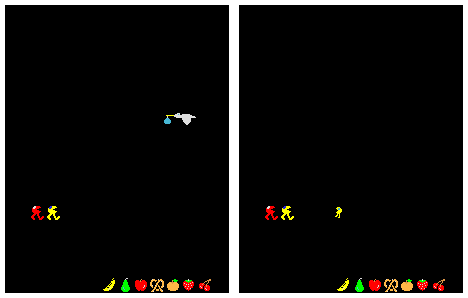 It brought four new mazes to the game, a new lead character with legs and feet, a new intro sequence, and monsters with antennae instead of ghosts. If this sounds somewhat familiar, it should. This mod kit became "Ms. Pac-Man", but before it was Ms, it was "Crazy Otto". It went through a few steps in the progression, all of which I will cover below. 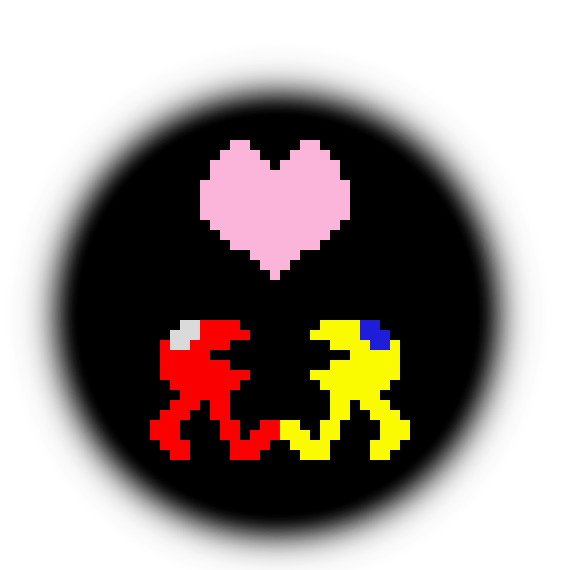 If you want a more comprehensive history of Ms. Pac-Man, you should watch the video of Steve Golson's presentation "From Crazy Otto to Ms. Pac-Man". It covers many of the details that I used to create these. 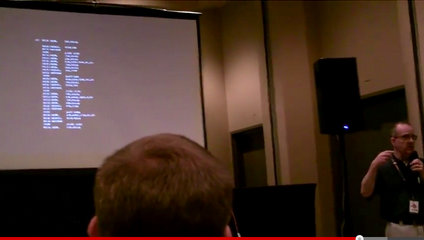 Links to the PAX-2012 and MIT-2014 presentations of this are available at the bottom of this post, and are well worth your time to watch. All of the sets I present here are directly based on sets that he described, demoed, or showed screenshots of, in an attempt to recapture the history of this iconic video game. All of these are available either through online repositories. Links for all are at the bottom of this post. None of this is to be used or repackaged for profit. This is all for educational and historical reasons. It's okay to drop it into a free-play machine as a museum piece... It is NOT okay to include it with a multigame that you're selling, etc. Don't be a jerk. Okay... All of that is out of the way. Let's get into the differences between the romsets, and the patches necessary to make them happen. I'm going to use the names I came up with for the sets to differentiate them here. Details of differences and dates were gleaned from Steve Golson's presentations. The following ROMsets were released by me (version 05) on April 19th, 2014. They were playable on a 13" JAMMA test rig (on a Yenox bootleg mspac board) in the lobby of BarCamp Rochester on this day as well. I switched the ROMs back and forth between the "PZ" set, and the "Pac-Woman" set. And now I'll list off details about what makes each particular release distinct, as well as some info about recreating it, backwards, from a standard "mspacmab" bootleg ROMset. Character and sprite roms for OttoP1. These are pixel-for-pixel copies of the original. This one was one of the more interesting hacks to work on. A lot of what makes this one unique was to be eventually obliterated by Ms Pac patches. At first I tried reversing the one patch in Pac-Man that jumps to Ms Pac romspace, where the new "marquee" intro happens, and just let it fall back on original code. This kind-of worked. The problem is that it used quite a few of the text slots, which were re-used for the new marquee introduction. To fix this, I reverted many of the text strings to their modified Pac-Man versions, eg Mad Dog, Killer, etc instead of Inky, Blinky, etc. The GENCOMP logo was already in the character set, so i just needed to remove the jump to the Midway logo and copyrights, and replaced one of the copyright strings with the characters necessary to draw out "GENCOMP" ("pqrstuv"). I also used a feature of the text render routine that I'm fairly certain no one else uses anywhere else, and that lets you draw the text out in multiple colors, rather than just one color for the entire text string. Remapping the movement frames was fairly straightforward once I replaced the original math-based routine with my table-based routine. This is discussed in the section below "Player Sprite Picker". Remapping the colors, characters, and sprite frames was fairly easy once I was able to use the rosetta from Golson's talk to figure out some of the animation format. Past that, It was a bunch of experimenting to determine what parameters did what (color, speed, location, etc) The 'female' character from the intermissions required more attention, since it now uses a different palette color (red), so all occurrences of the color (12 of them) are replaced from 0x09 (yellow) to 0x01 (red). With a little bit of sleuthing, I was able to use this as a kind of rosetta stone, to figure out the animation format. These animation scripts are used for the intermissions, as well as the introduction attract "marquee" screen. This becomes more important with the P5 (Pac-Woman) hack below. 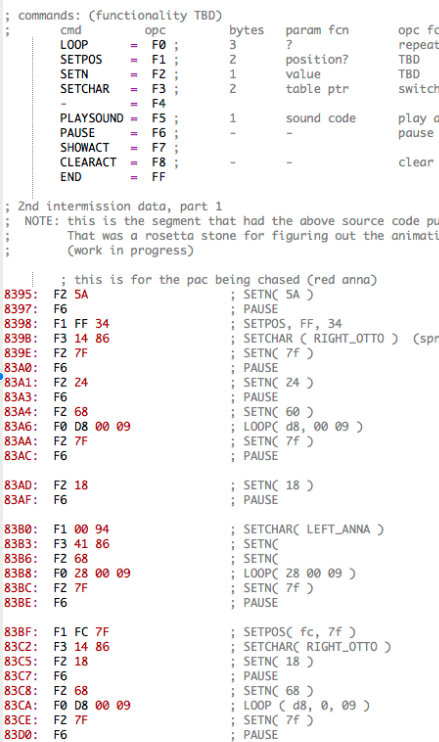 For the record, here's the above code chunk, but in the mspac.asm disassembly project, showing that we have a better grasp on how these scripts work. The graphics roms for P2 are similar to P1. The sprite rom (second) is identical. The character rom (first) is upgraded to the MsPac version. Notice the marquee graphic instead of the scores in the character rom. Marquee intro sequence, with "Bonnie" instead of "Sue"
Replacing "Sue" with "Bonnie" was a simple text replacement. Same with the Midway logo. The year line was removed from the final product, and the other line was just moved down, and changed to the text seen above. Nothing really major. All of the guts of this was accomplished in the P1 variant. Again, this was just further text changes and tweaks. Nothing major here. This one signifies two different graphics rom sets with the same code underneath it. "P4M" specifies the version with Crazy Otto Monsters, while "P4G" specifies the standard ghosts. For this version, the character ROM is basically the same as P2 above. I switched the layout for Super Pac0Man to be closer to the Pac-Man layout. Game and character names on marquee introduction changed to "Super Pac-Man"
All of the changes here were explained in previous sections. The character movement table was used to tweak the frames of animation to the Pac-Man standard. The death animation frames were remapped to what Pac originally had. Also the color of the "female" for the intermissions was retained as red as in the above, but is now a red Pac-Man puck, rather than an Otto with legs (AKA "Anna"). The Pac-Woman set is based on Ms. Pac-Man. The orientations for the death animation are the same as in the final MsPac. I've included this in yellow so you can see the woman graphics appropriately. The red/blue/white version is included for comparison with the above examples. This one got a bit interesting. Golson didn't have any demonstration of this other than a screenshot of "Pac-Woman" in the graphics ROM, and the intro screen animation. I interpolated this up from what I had for P3, as well as putting her in place of Ms. Pac-Man in her romset. He even said that there wasn't a playable version of the ROMs that existed... which makes my P5 set even more interesting, since we can now actually try it out. Since I now knew most of the animation format, as explained earlier, I was able to tweak the animation segment table to point to a new section for Pac-Woman's introduction. It does the same thing as before, where she walks in from the right side, and stops in the middle of the screen. But from there, she turns and moves down a little bit. I did a bunch of tweaking to the speed, distance, and ending frame to try to make this look as much like the demonstration video as possible. He stated that this version was abandoned due to the fact that when she's moving away from you, it's easy to confuse her with the red ghost. And he's absolutely right. From this stage, they generated a slightly different character, again with a bow on her, and she became the Ms. Pac-Man that we all know and love. This one is a multigame version of P1-P3, plus an additional fictitious mode not based on any single romset. It also has additional patches for playability. You select at startup time which variant (P1, P2, P3, PZ) you want to play as well as whether you want the fast or regular variant of it. Once you pick that, it behaves like any game above. While it's running, holding P1 and P2 start and pressing the joystick up "drops a quarter". Holding those and pressing the joystick down resets the machine, so you can pick a different variant. This one is perfect for your home arcade, MAME machine or other emulator. PZ mode also selectable - Ms Pac marquee intro, with GENCOMP logo. This one got a little complicated. In P1 above, I was able to just swap out the Ms Pac text table and restore the Pac-Man one. I didn't have that luxury this time, since we needed the Ms Pac text table to be intact for the P2, P3 and PZ versions of the game. I implemented this by hooking in to the actual text rendering routine. It skips out and goes to my own routine which checks to see if the current game is P1. If it is, it uses a reproduction of the Pac-Man table, but out in my memory space, and with a few strings restored to the OttoP1 versions. This one has the original P1 strings, rather than the re-used/remapped strings that are used for the Marquee introduction. One other modification done in this patch is the check for if the game is trying to render string 0x13 (copyright) or 0x35 (copyright year). Since each variant has different versions of these, the routine uses the variant number as an index into its own string table, and draws the appropriate-looking text to the screen. This does get into something though. How do we know which game and variant we're playing. We need to store it in RAM somewhere nonvolatile. We can pick someplace unused, but it might get used and we haven't figured out the documentation yet. Or we can use a trick that I figured out while working on a multigame Ms. Pac a few years ago. The stack pointer always starts at 0x4fc0, and works down from there. Nothing ever goes above it other than sprite registers. So, if we just patch the game code to start the stack pointer down a little bit, we have a few bytes that we can use for our own storage. The test for the coin drop and reset hack was hooked in to the routine that checks the coin slot switches. This gets called often while the game is running, so it seemed like the most comprehensive place to insert our routine. Before it checks the coin slot switch, it will check to see if P1 and P2 are being pressed. If the joystick is also being pressed up also, we "drop a coin", and if it's pressed down, we reset the machine, so that the player can pick a different variant to play. This set also drops the "jumble of characters" standard MsPac startup tests. All of the patched romsets mentioned in this post are available through links at the bottom of this post. There are a few patches that got applied to just about all of the sets in one way or another. I didn't want to change any of the gameplay behaviors, so I didn't fix the killscreen at level 240ish. I also didn't apply the "Fast" hack to any of these sets, since I wanted to reproduce the original gameplay, not a "comfortable playable set". If you want that, use the "OttoPZ" multigame, which is tweaked for general "daily" use. First of all, due to nothing being mapped in memory space above 0xAFFF, writes to those locations map down to lower memory. That is to say that writes to 0xB000 will acutally occur at 0x4000. The emulators do something weird with this, and the writes disappear into unreferenced 'ram' space. This is a problem because the text rendering routine (at 0x2c5e) does something weird with it. You call this routine with a number, an index into a list of pointers to text structures. The first item in the text structure is the offset into video memory that the text should start. The upper two and lower two lines use a different arrangement of bytes, so they need to behave differently. This behavior is signified by setting the high bit (0x8000) on the offset. Well, if we now have text that was supposed to be at offset 0x00FF, but it is in that region so the high bit is set (0x80ff). This offset added to memory space at 0x4000 produces 0xC0FF as the starting location. In real hardware, this is fine, since the high bit is not connected, so the write actually happens to (0x4000 + 0x00ff), but in emulators, it actually happens at 0xC0FF. There's a patch that fixes this -- it masks off that high bit when adding in the offset to the video base pointer. Another patch standard on all of these is replacing the original function that determines what sprite to display for Pac/Ms.Pac/Otto. The original did some sort of weird math to determine the sprite number. I replaced all of that with four hooks into my code that loads the appropriate four-entry table (four hooks; one for North, South, East, and West.) 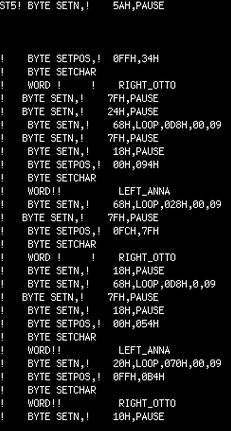 This code actually fits over the original code, without needing any extra space... in fact, it's smaller and more efficient than the original at 58 bytes instead of 81 bytes... plus, and more importantly, it's MUCH easier to hack in different sprite characters for different graphics sets, which I needed to do. I'm actually kinda surprised that Otto/Msp didn't use a table for this. One obvious modification is that all romsets have a splash screen on startup. I didn't want my reproduction sets to be mistaken for the real thing, should it ever be released. At the end of the startup tests, just after the test grid is drawn, it is cleared, and then my own routine occurs. This one has its own text string table for the standard text routine at 0x2c5e, so as to not need entries in the standard string table. It will draw out info about the romset, my email address, and after a moment, it prompts the user to press a button (or move the joystick.) (The "clear screen" routine was also re-added as a patch, since the original wasn't easily callable. NOTE: I pursued this project on my own, using only publicly available information. No direct contact was made during development by anyone involved with GENCOMP nor Midway nor Namco. This is meant to be a historical/educational project, not for profit. The use of copyrighted materials is covered by fair use, as this is for educational use. It is fine to use this for museum-type displays, but not included in a multigame that you're selling. Don't be a jerk. NONE OF THESE WORKS ARE TO EVER BE DISTRIBUTED FOR PROFIT, EITHER ALONE, OR REPACKAGED. I tried getting this to work in MAME but it keeps giving me errors everytime I try and boot it up into MAME....any solution to this? What kind of errors? You should get MAME complaining about ROM checksums, but it should work otherwise, at least on older versions of MAME.